Havana Mania is a major draw among people who know this cuisine, and a cultural portal for those who don’t. I love the creativity of California chefs, but sometimes they don’t know when to leave a good thing alone. This seems to be most extreme with Mediterranean food. The fact that our Golden State produces every kind of produce under the sun doesn’t mean they all belong in that bowl of pasta primavera. That sprinkle of caviar on top added to the bill but not the flavor, so I didn’t need that either. Nobody around here tries those kinds of tricks with Cuban food, which is generally served sans pomp and circumstance. Though the country had a tiny elite in the pre-Castro days, they didn’t develop a cult of presentation, so Cuban plates typically convey the allure of good home cooking. 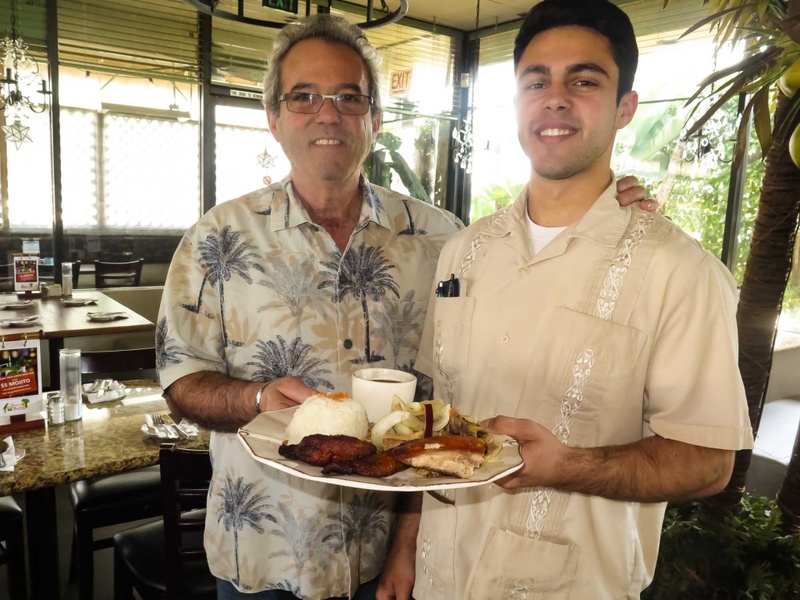 You can get your fill of that wholesome, unpretentious cuisine at Havana Mania, which has been serving in a corner of the shopping center at Manhattan Beach Boulevard and Inglewood for over two decades. You may have noticed the sign but not the establishment because a hedge blocks the view, but inside is an impressive interior. There’s a small bar by the entrance with a decent selection of Caribbean rums, a stage across from it, where bands belt out rhumbas and jazz on weekends. The dining room is nicely decorated dining room with a whimsical fake coconut palm. When the band isn’t playing the sound level is comfortable. On their first visit most people order the roast pork, chicken with garlic sauce, or the ropa vieja stewed beef. There is some sense to doing this because those are the only items most people know. Of those three, they generally execute the roast pork and ropa vieja very well, though the chicken was slightly dry the last time I ordered it. (When I mentioned this to a server he immediately offered to have it re-made.) If you’re not familiar with this cuisine I suggest the ropa vieja because it exemplifies the cuisine: hearty and flavorful with the tang of bell pepper and onion, but not hotly spiced. They offer a combo plate with the ropa vieja and pork along with picadillo, a mix of ground beef with vegetables, olives, and a dash of cumin, along with rice, beans, and fried plantain on the side. Along with a brief education about Cuban food you’ll also learn that this place gives a lot of bang for the buck – unless you have a huge appetite you probably won’t finish it. Some people never move beyond thei greatest hits, but there’s a lot more to like on this menu. Start with the appetizers, despite the fact that you don’t really need to order them unless you are starving or sharing. If you’re dining with someone else you might consider ordering two starters and a meal and splitting it all. Their calamari is good but not particularly unusual, so it’s a safe choice. But they also serve rarely seen Afro-Caribbean items like mofongo and fufu de yuca. These preparations of green plantains and boiled yuca are both starches topped with your choice of meat, and they’ll introduce you to some interesting alternatives to potatoes. Both are said to be healthier, but I don’t pass judgment on that and can just say they’re more interesting. For mains, I suggest the vaca frita, which is essentially Cuban-style pot roast marinated with lime, garlic and onions and sauteed in a frying pan just before serving. It has the tenderness of pot roast with a crisp exterior, which is a neat trick. Another menu item here might surprise you – the Cuban version of fried rice. Cuba has a large Chinese community that arrived in the late 1800s and contributed greatly to the cuisine. That’s why many Cuban dishes contain soy sauce. The Cuban version contains most of the items you expect, like egg, bean sprouts, and green onion, but they’re in larger pieces and the sauce is a bit different from anything you’ll get in a conventional Chinese restaurant. I like the traditional Chinese version a better, but was glad I tried this. If you’re interested in the idea of dining here but have a family member who isn’t adventurous, steer them toward the Cuban style pasta. They toss fettuccine in garlic soy sauce with your choice of protein, tomatoes, onions, and cilantro. My wife was in a less than adventurous mood and chose this with salmon and mushrooms, and it brightened her day. If your fastidious diner feels like a sandwich they offer standard burgers, sloppy joes, and the famous Cuban sandwich with pork, ham, swiss cheese, pickles, and a mildly tangy dressing. To accompany dinner they have a full bar with a commendable rum selection, and they know what to do with them. Those who prefer their fruit unfermented might go for a tropical fruit milkshake, and those who like unusual non-alcoholic experiences will find Cuban as well as American soft drinks. Desserts are offered too, all somewhat on the sweet side except for the ice cream topped with chocolate covered espresso beans with a shot of espresso on the side. Cuban food isn’t as widely appreciated in LA as it is in cities with large expatriate populations, so Havana Mania is a major draw among people who know this cuisine, and a cultural portal for those who don’t. If you have been passing by without looking to see what is behind the shrubbery, consider stopping in.